It’s not often a new art project is also a huge infrastructure project for a city. 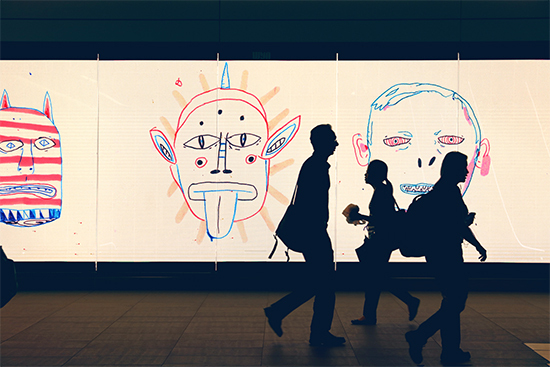 Since public art has become a standard part of both the art world and urban planning in Australia, we’ve become accustomed to art happening in small, unusual spaces. 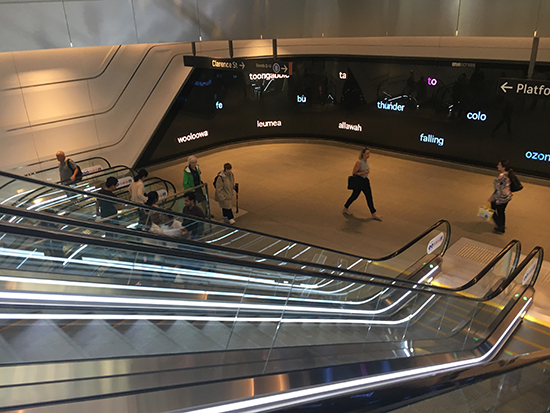 In laneways (as supported by City of Sydney), empty shopfronts (with Renew Newcastle having leapt beyond its home city), overlooked walls (the Elizabeth Street Gallery Project) and malls, you can encounter art by just moving about the city. But what is the next step for public art’s integration into the functioning of Australian cities? And can art act as a type of public infrastructure outside major galleries and museums? Wynscreen provides one possible answer to those questions, as well as a seductive projection of what cities could be like. 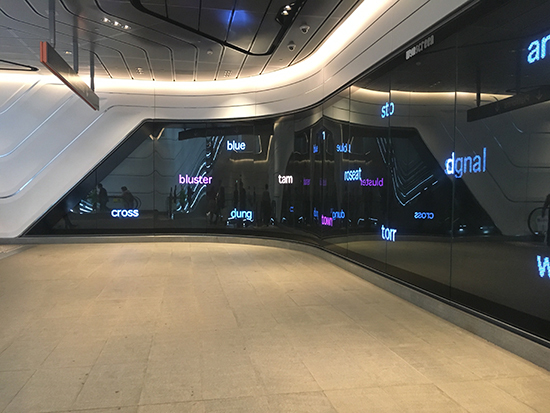 A media art installation incorporated into Wynyard Station, Wynscreen opened in December last year and has since become integral to the daily commute of many harried travellers. 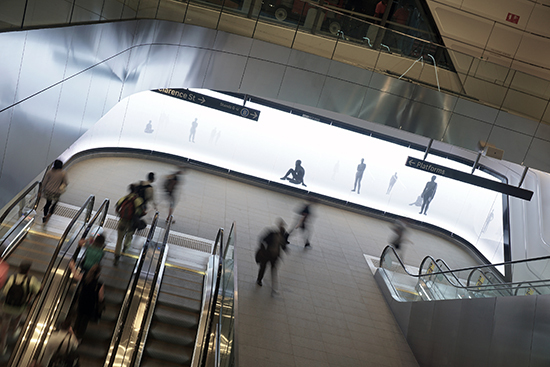 A large-scale screen, installed on a mezzanine between escalators, Wynscreen exhibits two specially-commissioned video artworks each day to more than 30,000 passers-by in Sydney’s CBD. While Vivid Sydney projects moving images for an audience on the streets once a year in the form of a festival of light and projection, Wynscreen differs in offering a permanent space built into the architecture of a major transport interchange: it’s not simply decorative and it’s not going anywhere. “It’s a unique screen in Sydney and Australia,” says Alessio Cavallaro, an associate of Cultural Capital, the project’s creative producers. “There are other screens in Australia that show some art content, but this is the first screen that we’re aware of that is solely dedicated to artwork without any commercial interjections. We were excited to be part of such a landmark project, with its unique formal challenges, its scale and potential to commission a really interesting range of new artworks specifically to surprise and intrigue audiences in that transit space.” The purpose-designed screen is three metres high, 22 metres wide, gently U-shaped and curved at the edges: its uncommon trapezoid shape, as well as the space in which it is situated, make the project super site-specific. The artists commissioned by Cultural Capital responded to three thematic platforms—time, travel and place—in their own diverse ways: some with abstraction, some figuratively, some performatively, some text-based. Among them so far have been a video of grand gestures and dance by Sue Healey and a work by Gary Deirmendjian featuring figures moving imperceptibly slowly. The screen and its surrounding space hadn’t been constructed at the beginning of the commissioning process, so artists responded solely to the curatorial brief and architectural drawings. That notion of associative thinking applies to all the works at Wynscreen. Given the location of the screen and that it’s not a conventional gallery, it is experienced impressionistically by diverse audiences day and night, glanced at fleetingly rather than studied. Generally, a work depends on a viewer spending time with it—say, watching a half-hour video from start to finish. But the works on Wynscreen build a relationship with viewers over incidental encounters—in accumulated moments of passing by the works over the course of weeks. “Most of what we refer to as public art is usually a sculpture, large-scale painting or 3D object,” says Cavallaro. “This project enlivens the space in a way that static works can’t do. Here, you’ve got the rhythms of the moving imagery, the changing shapes and colours. The flow motions of passers-by adds to the energy in the space and combine to create an experience of elastic architecture,” he says, of the way the screen appears to animate the surrounding building. In extending the space in this way, Wynscreen takes on a function: to help make a small part of Sydney, an often stressed and stretched place of rushed rhythms and sapped energies, more enjoyable for its inhabitants and visitors by building experiential public art into urban infrastructure. Sydney has all the pressures of other big cities. What’s Wynscreen’s role and function within that matrix, I ask. “Ideally, Wynscreen will become a regular art destination within the social and cultural fabric of the city, in much the same way that one actively visits MCA or AGNSW. Recurrent Wynscreen viewers have already experienced wonderful works by Sue Healey, The Lycette Bros., doeanddoe, Gary Deirmendjian, Ross Gibson and James Price. They clue into the rotational programming pattern and, hopefully, will keenly anticipate the next works after a month or so. So it’s not only regular commuters or casual passers-by but also the art-curious audience who will make the time to pause at the same level as the screen, or look down from the dress circle view at the Clarence Street entrance level to get the full panoramic sweep. It’s that kind of art-engaged audience that we want to develop, an audience that will intimately, irresistibly engage with moving image art works in a very public place, and have their own dialogue with the works.” The Instagram hashtag that has sprung up in response, #wynscreen, is evidence of that very public dialogue. From 15 April to 31 May, Wynscreen will showcase commissioned artworks by Nicole Foreshew and Pilar Mata Dupont. Read an interview with doeanddoe, makers, with Michelle Morcos, of Woven Moments which was shown on Wynscreen in February this year. Ross Gibson, Bluster Town (60-minute loop), 6am-3pm on even-numbered days and 3pm-12am on odd-numbered days until 14 April. James Price, History’s Page (2-minute loop), 6am-3pm on odd-numbered days and 3pm-12am on even-numbered days until 14 April.